How can innius help machine manufacturers? Integrating innius’ capable features with your machines will help you to stay at the forefront of the new industrial revolution. This revolution encompasses the industrial internet of things (IIoT), industry 4.0, smart industry, predictive maintenance, servitization, cloud computing, mobility and social collaboration. Whilst often loosely used as buzzwords, these terms are of great importance to machinery manufacturers. An important aspect of innius is that it can help open the door to servitization. Servitization is a significant and growing area of business for manufacturing companies. Essentially servitizing your business is about offering product-service systems to your customers, which deliver a mutual value to both you and your customers during the use of products. No longer do you simply build and sell machines, but also offer a service; diversifying your revenue stream and offering significant advantages to your customers. A servitized system can be implemented using innius as the bedrock. innius can aid the servitization of your business by enabling you to better understand how your machines are used, better predict when issues will arise, give better advice on maintenance strategies, respond faster when breakdowns do occur, collaborate with users to ensure repairs are dealt with quickly, improve your understanding of why machines breakdown and use all this as part of a continuous improvement strategy for future machine development. A servitized system therefore enables you to build better relationships with customers and increases potential parts and service sales. The ability to build enduring relationships with your customers, machine users, depends on the experience they have in dealing with you. Offering innius enabled machines to your customers greatly enhances the value of your machines to them and also gives you, the manufacturer, the means to provide proactive support and advice. For most production facilities, being able to track machine behavior and production efficiency KPIs, such as OEE, in real-time, is a technological leap forward. With joint access to this information both manufacturer and user can develop strategies to minimize equipment downtime and maintenance costs, whilst maximizing throughput and quality. Operator and technician training can also be simplified with documentation and media available through the innius mobile application. Diversify your revenue stream by being the default and preferred supplier for machine parts and service. Remotely monitoring the condition of a machine, being able to predict required maintenance and having the means to step in and collaborate directly with the machine user, puts the manufacturer in a strong after-sales position. In this way, innius can provide the backbone for a servitized business model. 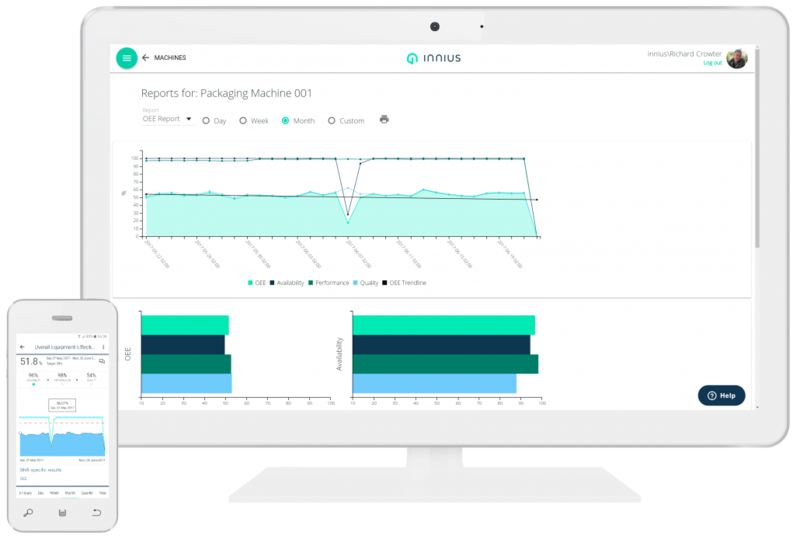 innius provides historical and real-time performance information based on individual sensors and KPIs, such as Overall Equipment Effectiveness (OEE), Mean Time Between Failures (MTBF), Mean Time To Repair (MTTR) and Energy Efficiency (EE). This gives manufacturers powerful insights into how customers use machines and how the machines respond. Having this empirical evidence allows you to improve machine specifications, and therefore provide machines which are better suited to your customers’ needs and hence more competitively priced. Having an enhanced understanding of when machinery fails and which parts are most likely to need replacing is essential when generating an accurate cost and profit business model for servicing and maintenance contracts. The performance history of a machine, provided by innius, is a powerful input for your Research and Development projects. It enables the fine tuning of machine specifications to suit the needs of customers and also identifies design weaknesses to be solved. In addition to optimizing the physical design of the machine, this information facilitates the optimizing of machine operating and maintenance strategies. For instance, this can lead to lower energy costs or reducing the amount of unplanned downtime. This advice can be incorporated into user manuals and shared as documents and media within innius. 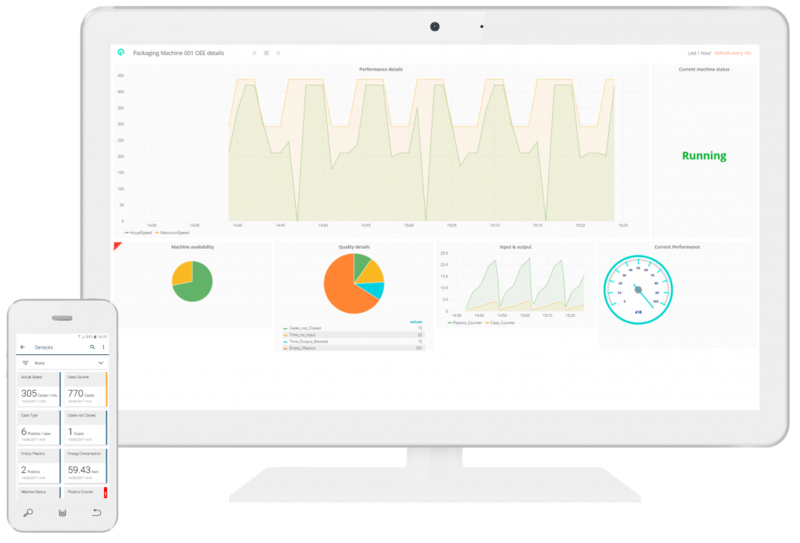 But operating and maintenance strategies can also be implemented in a more proactive way, by using the rules, tasks and notifications functionality within innius. This means that you can set up innius to automatically notify a user that they need to carry out a defined task, in response to a particular machine condition detected by the sensors. How can I integrate innius with my machines? If you manufacture machines which generate a data stream and can be connected to the internet, normally via a PLC, then they should be innius capable.If the PLC uses the OPC UA or DA protocol, then it can be connected to the internet via a computer or laptop running the innius machine integration software. If your PLC uses a protocol other than OPC, it can normally be connected to the internet using an eWON Flexy modem, running the innius machine integration software.If you’d like to talk to us about the specifics of your machines, please don’t hesitate to get in touch with us. Do I need any other hardware, once my machines are connected? Just mobile devices and a desktop computer to run the applications. innius is a cloud computing based service, so there is no requirement for on-premises servers. Can innius data be shared? Yes, through the security groups mechanism, it is possible to share selected data with other entities. For example: a user decides to share sensor data with a machine maintenance company, but keeps the documents and media hidden. The main thing to consider is that innius only reads your machine data, it can’t send anything back to your PLC or machines, which obviously has huge security advantages. In addition to that a number of industry standard security steps have been taken. These are fully detailed in the Knowledge Base. Or if you want to know more talk to us. 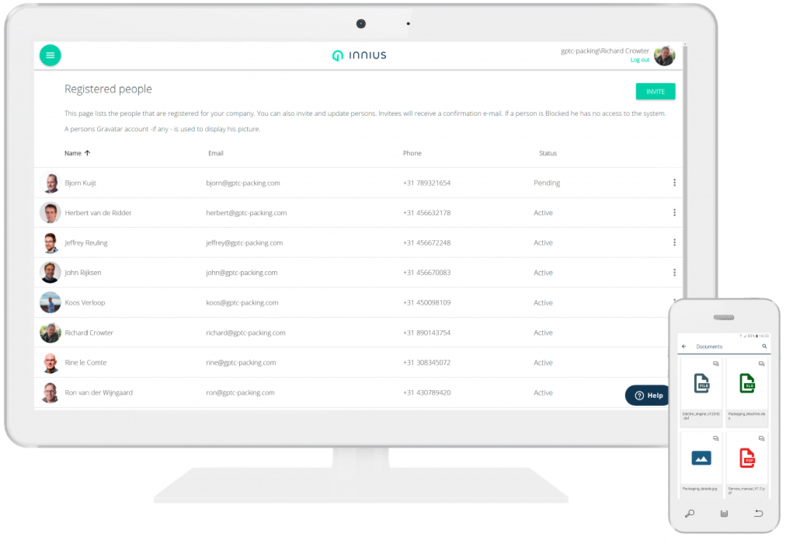 innius operates on a monthly subscription pricing model, giving you access to both the web admin app and mobile app. The cost depends mainly on the data usage in addition to a number of other factors. Please get in touch to talk about your specific needs. Can I supply innius to my customers using my own branding? Yes, please discuss with us the options for offering innius as a white label service. Curious what innius means for your business?